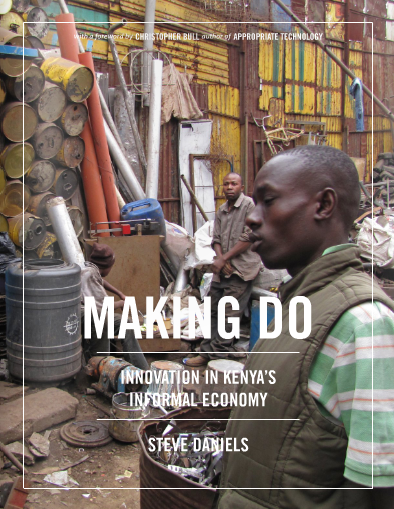 In Making Do: Innovation in Kenya’s Informal Economy, Steve Daniels of Brown University illuminates the dynamics of Africa’s informal economy to enhance our understanding of emerging systems of innovation. “Wandering through winding alleys dotted with makeshift worksheds, one can’t help but feel clouded by the clanging of hammers on metal, grinding of bandsaws on wood, and the shouts of workers making sales. But soon it becomes clear that this cacophony is really a symphony of socioeconomic interactions that form what is known as the informal economy. In Kenya, engineers in the informal economy are known as jua kali, Swahili for “hot sun,” because they toil each day under intense heat and with limited resources. But despite these conditions, or in fact because of them, the jua kali continuously demonstrate creativity and resourcefulness in solving problems.